With 10 years now passed since the Gloucestershire floods of 2007 we cast our minds back to the magnitude of those events that affected significant numbers of people and communities across the County and surrounding areas in the middle of July that year. Only a matter of weeks into my first term as an elected councillor at Tewkesbury Borough, I remember well that the significance of what felt like a tropical rainstorm parked overhead for most of that Friday would go way beyond a vast extension of what sadly remains a regular local event. So much water trying to find its way to a natural watercourse created rivers and lakes in the most unexpected locations and seeing upended cars by the roadside and in ditches the following day, like some scene from War of the Worlds left a picture in my mind which was at the very least quite surreal. But it was on the Sunday, when word really began to spread that there had been a problem at the Mythe Water Treatment Plant as a result of the Flooding which meant tap water was about to run out, that the real consequences of what we were afterwards told was a 1 in 100 year event really began to unfold. After an unexpected phone call from a constituent that afternoon, asking where they could get water I found myself spending over two weeks delivering water and coordinating drinking water supplies around my Council Ward, increasingly conscious of how very thin the veil of individual social responsibility, commonly known as civil order actually is, when it was pricked in so many other areas by people fighting over water, steeling it and even urinating in bowsers where communities had been supplied. We can only begin to imagine what would have happened if the emergency services had not won their battle against the rising floodwaters of the River Severn when just centimetres from flooding the Walham Electricity Substation just outside Gloucester. From my own perspective, the contact with members of the community I then represented that getting so directly involved gave me was of incalculable benefit. Not only did I see the impact of the breakdown of our utility service supply at first hand, I also gained real-time understanding of flooding and also what can be the very localised nature and requirements of our arbitrary Planning system, which continues to fail local people, and the communities in which they live every day. The news channels have today made use of the good-news stories which followed the 2007 Floods, such as the permanent flood protection and defences that have been erected in places such as Upton on Severn, just a few miles upstream from Tewkesbury. Yet the bigger story beyond remains the lack of understanding or failure to acknowledge the real impact of building not only near or on flood plains themselves, but also on ground which in extreme weather events, would or has historically become the natural channels where a rainfall overload will find its way to our local main rivers via the floodplains in between. Sadly, consideration of the issues which sit behind those which are most obvious is not something that Government at National or Local level beyond is happy to embrace, particularly at a time when the politically expedient route to solving our housing supply problems is to simply focus on everything that encourages people and businesses to build. 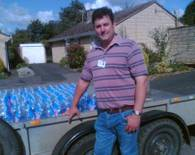 Events like the 2007 Gloucestershire Floods are not rare events. This fact has been only too well illustrated by the many different experiences that Towns, Villages and in some cases even Cities have been continuing to experience ever since, and yet we still have a Planning system, environmental policies and public sector approach which is in real terms not even fully reactive in nature. The pain, loss and suffering which people suffer, often much longer than during the time of these flooding events themselves should have by now resulted in a proactive approach to flood prevention. But 10 years now gone – a period in which even the very slow wheels of Government could have delivered the creative and fully considered policy changes and developments which might at least have future-proofed existing properties from what might be avoidable disaster – Politicians are still failing to adapt to dealing with the biggest issues which are facing communities, albeit the ones that are far from being obvious. Flooding and the affects that it can have on all of us has been a consistent theme since the very beginning of my time as a local Councillor near Tewkesbury. If you come from outside the immediate area, memories of the summer of 2007 and the notoriety of the July ‘Floods’ in Gloucestershire tend to focus attention more on the water shortages that hit the County for those who still remember, rather than the significant and extremely rapid flooding event responsible which took place in just one day on Friday 20th July 2007. In less than 48 hours, the life that we all so easily take for granted was compromised. Not because of a war, famine or catastrophic crash of our economy, but because the drinking water in our taps was literally switched off when flood water polluted the tanks at the Mythe Water Treatment Plant near Tewkesbury. These floods suddenly affected everyone, and not just those who had been flooded out; many of whom were themselves within whole neighbourhoods where river torrents coming through your home would normally be the very last thing on your mind on a midsummer day. The complacency and complete lack of urgency demonstrated by officials that follows an event of this magnitude when life is perceived to be ‘back to normal’ is a strange thing to deal with if you have had firsthand experience of it. But this is exactly what people in Tewkesbury and the surrounding Villages have had to frustratingly deal with ever since and what the people of the Somerset Levels have clearly had to endure now too. Sadly, Towns, Villages, Hamlets, Communities and Businesses simply at risk of flooding don’t have the newsworthiness of water in the way it does when it literally covers the ground. This is a real problem for anyone living with the realities of these events as news teams seldom camp out for anything good. Most people would much prefer not to have the camera crews taking up semi-permanent residence ever again to report such stories. But it seems that it will take exactly that to happen before any sense of urgency to deal with existing and weather-changing threats or those that Developers may indeed be creating, will be adequately addressed. Taking nothing away from the many people who spent up to a year living in caravans on their driveways after the 2007 pluvial ‘event’ who now also have insurance ‘blight’ as a result, some areas around Tewkesbury and Gloucester such as the historic Village of Walton Cardiff in the Ashchurch with Walton Cardiff Ward that I represent regularly have to face the prospect of river or fluvial flooding too. Residents there have sadly come to be so used to it, that one homeowner with the means to do so has even bought an amphibious buggy which he uses to help other Residents when the roads become impassable. Whilst community-minded in the extreme, I will probably be far from alone in having concerns that such acts are taken by Government Politicians to mean that there is a general acceptance on the part of those living with the risk of flooding that they are simply happy with the status quo. Let me tell you; they aren’t. The constant threat of both types of flooding is never far from the minds of those whose homes are at risk of either the flooding that it is ‘reasonable’ to expect, or that which ‘normal’ disaster planning doesn’t allow for that comes in the form of events that the Environment Agency and other Organisations communicate in terms such as ‘a one in a hundred year event’. The problem is that the Floods in question aren’t only happening once every one hundred years or whatever the particular ‘banding’ may be and the type of lottery derived statistics that are being used as this benchmark for support to our communities is now proving to be a form of gamble that’s only paying off for those who are most distant from the problem. There are actually some very painful realities sitting behind the lack of support for our communities. Getting the results that we all need relies on a significant number of issues needing to be addressed and whilst I have no intention of dismissing the action that the Prime Minister and Eric Pickles are now reactively taking to the Somerset problems in particular, it is only by dealing with all the problems comprehensively – and accepting that matters which on the face of it have little to do with Flooding also have an effect – that there will ever be any genuine first and meaningful steps to dealing with this situation in its truest depth. In isolation, we can all easily draw the conclusion that solving Flood Defence problems is just about the money that Local Authorities, Central Government Departments and Non Government Organisations such as the Environment Agency have to spend. But it isn’t. Essentially any work that is undertaken does have to be paid for by the public purse as Flood Prevention is fundamentally in the public interest. However, the days when such an issue in itself was enough to trigger an immediate and responsive spend on a ‘size doesn’t matter’ basis has long gone – if it ever actually existed before in anything other than wartime. The problem for us today is that the Country is now effectively bankrupt after generations of profligate spending by Government on Policies which are considered populist only in the sense of the number of votes that they will win. They should have been in the best interests of the wider community – which is arguably how every political decision should actually be made. Budgets are and will most likely continue to be cut from all Publicly Funded Organisations and will continue to do so whilst the gargantuan plate-spinning effort to keep the Economy and Public Spending from smashing on the floor continues. Lack of discussion and reference to the National Debt, whilst overplay on the prospect of reaching a zero Deficit in maybe a few years time is a key indicator of the high stakes game that is already well in play. Any upward change in spending that might come from a change in Government could actually bring matters to a conclusion even sooner. The £100 Million promised just to the Somerset Levels alone this week might sound like a lot of money to those struggling to survive on an average wage. But in real terms and without any unfortunate pun intended, it is in reality a mere drop in the ocean of the fund that would actually be needed to cover the cost of protecting the UK against Flooding if no other options were to be genuinely considered. Painful as it is to accept, the fact is that without significant change in the way that all parts of Government raise and spend money, there will never be anywhere near enough funds to address the Flooding problems with a cash only solution and Government really needs to start being straight with people about this. Prevention is almost certainly better than waiting to work on a cure. Whilst many people who have experience of a Flood Event will already have significant anecdotal evidence to illustrate how building on flood plains has exacerbated the problems that we already face, it is the Planning Policies and Procedures which exist today that provide part of the greatest threat to both individual properties and whole communities. A good example is that Planning Policy arguably only takes fluvial flooding into account, the effects of which themselves can open to the bizarrest forms of interpretation possible. A case which demonstrates this well would be the Wheatpieces Development within my Ward, some of which is well known locally to have been built on what was mapped historically as flood plain. However, I understand that it is not considered to be as such for Planning purposes by the Environment Agency – and therefore Planners – because the houses built on these areas were erected on built up land or infill which when the earthworks were completed then complied with the requirement of being the required ground level height above Ordnance Datum Newlyn, which I also understand was at the time of Permission being granted, some 12 Feet. Such an undertaking is for current Planning purposes apparently enough to quantify that a development has not been constructed on Floodplain, but then gives sparse consideration for the knock on effects that creating an island in the middle of natures own flood remedy will have had on properties that would otherwise have been at significantly less risk of flooding. Build as many reed beds and flood tanks under a new development as you like, but when storms of the nature we are now experiencing come in the increasingly menacing way that they do, such developments can be akin to dropping a breeze block into an overflowing bath. Some will call it cynical to say this, but evidence strongly suggests that the deficiencies in Planning Policy today leave existing homes and developments open to threat from the increased risk of flooding which is created by new developments – the properties upon which are unlikely to face the same threat. Couple this with the headlong rush by successive governments to build houses as the silver bullet to solve all ills, and you might begin to realise the level of threat that a Planning Policy which does not consider the whole picture has actually become. Planning Policy isn’t actually working in the best interests of anybody other than the Politicians, builders and companies that lend people the money to buy the new houses. The irresponsibility of the Government and Opposition in hanging the fate of the Economy and those desperate for affordable homes on house building is not only fueling the growth of an already uncontrollable credit bubble; it is also determining a fate of misery and loss to the owners and occupants for many existing homes who will almost certainly be put at greater risk of flooding. Symptomatic of our correctness culture has been the exponential rise of the Quango and distribution of powers to what are non-elected Bodies, some of whom don’t even report to Government Ministers. A number of these are involved in both the Planning system as ‘Respondents’, but also within the other processes which relate to Flood Prevention. A great weight of responsibility has been given to many of these Organisations and their opinion, view or interpretation of their Policy in relation to specific cases and subsequently are seen to have what can sometimes feel like limitless power to those who have witnessed it. Alone, their objections can halt an application on the spot, whilst the absence of an objection from any such Respondent can and does lead Members of Planning Committees to conclude that objecting to an application is little more than a futile act, as with these agencies not objecting, a Planning Inspector will surely approve it should the Application then go to Appeal. With all working to very centralised; one-size-fits-all Policies which are without any real consideration for the very localised issues that the Planning System does encounter and specifically Flooding issues, the realities of the influence that these bureaucratic entities have is significant. Developers know that if they table Applications that effectively tick all the boxes that each of these Organisations have on their checklists, Local Authority Planning Committees simply won’t have a prayer if a developer then takes a rejection to Appeal – which they rarely have hesitation in doing so. The influence that these Organisations have over the Planning Process is simply too much and is at best an arbitrary way of dealing with what are ever increasingly sensitive issues that require a level of interpretation, consideration and understanding which genuinely reflects locality and the concept of Localism that the Coalition Government has done so much to sell itself upon. The Environment Agency once again plays a critical role in the preventative maintenance which is already or should already be undertaken on watercourses and rivers, as do Local Borough, District, County and Unitary Authorities that have Drainage responsibilities. The often complex relationships or rather chain of decision making that arises as a result of multiple organisations or ‘stakeholders’ being involved in a decision relating to Flood Prevention will almost always cause delays, or worse still, like the Planning Process, will result in one of them being perceived to carry more weight, and for the buck to effectively stop with them. In a compensation and blame culture, taking action actually appears to be the very last thing on the mind of the Representatives of these Organisations, and this can serve no purpose other than their own. Sadly I do not recall one conversation with Residents or indeed other Politicians which has reflected positively upon the work of the Environment Agency. I have spoken to Farmers who have watercourses and rivers crossing their properties and most look back comparatively fondly on one of the forerunners of the Environment Agency, the National Rivers Authority (NRA) which is remembered for a much more proactive, less obstructive and therefore constructive approach to clearance and dredging. I can remember seeing specially modified tractors working the banks of the contributory rivers to the Severn during the period of the NRA’s tenure and it is clear that anecdotal evidence of the benefit of such work correlates well with a period when fluvial flooding seemed to affect a whole lot less of the area. The NRA itself adopted the responsibilities which were once included within the portfolio of the ten former Regional Water Authorities with what we now know to be this expensive, but critical form of work not being adopted by the privatised Water Companies. One could easily conclude that the formation of the Environment Agency and absorption of the NRA within it in 1996 was seen as the ideal time to cut back on proactive and costly Flood Prevention works and that this may have been considered a much safer time to do so rather than the late Eighties when Privatisation itself took place. 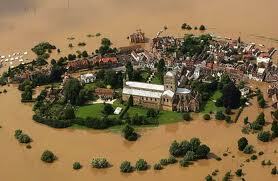 I will add that one of my own experiences of questioning an Environment Agency Representative during a post-flood seminar held at Tewkesbury Abbey in the weeks following the 2007 Flood, I can honestly say that I found the responses given to my questions on dredging and clearance to be conflicting. I walked away with the distinct impression that giving excuses rather than any meaningful response was the chosen modus operandi of this Organisation – even when they might have honestly said ‘there isn’t the money available’. Flooding is an issue that is simply not recognised for the problem that it is right now, has been and will be by Government and the Staff of the Organisations that matter. People making decisions do not have the first hand knowledge or exposure not only to the Flood incidents themselves, but to what can be the very localised nature of the contributory factors as they exist today and how they may come into play as the result of apparently unleashed development. Officers of all the Organisations discussed who may be rightly and properly qualified to be called experts arguably don’t use their expertise in the way that the public should rightly expect. Tick box decision making appears to have replaced that of using common sense and recognising the need to seek the fullest perspective, arguably for little more reason than the threat which comes from taking responsibility within the protectionist culture which is now an inherent part of Government Administration. The earlier system of buck-passing which grew decision making into a very expensive system of ‘one-job, one-role; keep passing it on until we can justify engaging a consultant’, has systematically inflated the size of ‘back room operations’, and taken money that was available away from frontline service delivery, where ironically as a result, the need for even more precise and robust decision making becomes ever more critical. We can all see the results. There is no question that weather patterns are changing. We don’t however know if this is due to a phenomenon like global warming, or whether it is actually part of very extensive climate changing cycles which have affected the earth historically, and which there is evidence to suggest might be the case. Whatever the cause, it is clear that Government and the Organisations involved have not developed a proactive bias to Flood Prevention measures and that the approach taken is far more reactive in nature. It is what could easily be called ‘out of site; out of mind’ management, as work only seems to be concentrated on issues which are in the Public view – or can be guaranteed to be regularly so. Many will probably be quietly asking whether the ‘intensity’ of effort now focussing on Somerset will for instance continue once the roads are passable and life is deemed to have returned to ‘normal’. These are apparently ‘irregular’ events after all. But it was indeed telling that the Military first arrived in the form of just two Personnel who apparently decided that there was nothing at that point which they could do. Given that much of the amphibious and landing–type craft which could at very least help these stranded Communities are likely to be based with Royal Marine and Royal Naval Units in the South and South West anyway, should it really have been that difficult to put some of these vehicles on low-loading lorries and get them to the Levels within a few hours? Either way, attitudes must change even if the funds are limited. Government has been entrusted with great power on our behalf along with the responsibility to use it. So why aren’t they? The painful reality is that there are likely to be other contributory factors that I and certainly others are not aware of, but which are important all the same. Money is the overriding factor which has, is and will continue to inhibit the development of capital flood defence projects whether they are inland, riverside or on the coast and there is a danger that neither the realistic sums which could be raised for these projects, nor the changes in the many other policy areas that could positively assist will come into being unless there is a complete change in the way that Politicians assess, develop and then act upon their priorities. As we have seen in Tewkesbury with the effect on water supply; in Devon with the effect on Railways and in Somerset with the effect upon land and roads; doing nothing places critical Infrastructure at risk. So funnelling truckloads of borrowed cash into any service or benefit that will put around 350 MP’s or more in power for the next five years when all they will then do is think about doing the same again – all to the incalculable cost of the majority of Taxpayers – can simply no longer be sustained. With money being the problem that the Government doesn’t want to talk about, it is unlikely that any Minister will stand up any time soon and simply say ‘we don’t have the money to do all the work that needs doing’. Even less likely would be finding one of them saying and actually meaning ‘we don’t have all the money, but we will make all the changes that we possibly can which will serve all of your interests’ best’. When these Politicians have moved past the sound bites, the portrayals of being belated men of action and giving hollow apologies when pinned down by interviewers, the best advice any Politician could now take would be to stop treating the Electorate like they are idiots and that the issues facing Government are beyond their understanding. It will be in everyone’s interests to develop a culture where local voices are heard even when they don’t have the profile of people like Michael Eavis, the founder of the Glastonbury Festival who wrote a very useful and telling article in the Mail on Sunday on 2nd February 2014. Mr Eavis brought precisely the kind of invaluable and historical knowledge of the Somerset Levels to the table that no doubt many people could, if they were given the opportunity to do so. Too much useful information is discounted because of the emotional buy-in that often accompanies very local issues and which is often badged as being Nimby-ism. Yes, there are people who will say no to everything simply because they don’t want change or others who make demands simply because they want something for themselves. But applying this very negative and destructive view on anyone who is promoting a local view, without taking adequate steps to discern the value from what they may be saying, is ultimately selling everyone short and is far from the hallmark of a fully enlightened form of Politics. In the absence of the money that we need being available without either borrowing or taking money from services which may actually be invaluable elsewhere, Planning and its reform will be a key factor in proactively addressing future Flood Events. Power of veto – whether negative or indeed positive, should never be held in the hands of unelected bureaucrats or people who are neither trained nor prepared to make decisions which truly reflect the very localised and area specific issues which relate to flooding. We must move away from tick-box decision making which brings little more than the one-size-fits-all mentality to almost every Planning Application that will have an affect on the wider community and particularly so when it comes to Flooding. Agencies and Local Authorities should inform, but ultimately not define the planning process and the only eventuality in which Government Ministers should intervene should be at moments when the genuine National interest overrides that of the local community and those who will be directly impacted by developments within it. This could be done by transferring all Planning Decisions to a local ‘Planning Court’, in which evidence could be given by the Applicants, all respondents and interested parties to a Judge or panel, but where the power of appeal is limited to the same or a similarly localised Court, and where the Policies upon which decisions are based are those developed democratically by the Local Council’s themselves. Such a process would be much more tailored to localised needs and allow and encourage Agencies to advise rather than administer, and leave people feeling much more empowered when it comes to their fate. It would also give the opportunity to consider new forms of information that come available through advances in technology and understanding, such as up-to-date computerised flood or water behaviour mapping, which would allow considerations to be made for issues such as pluvial flooding, which is likely to become ever relevant. Central Government would have its role to play in assisting this by changing all appropriate Policies to reflect a genuine need-led, rather than projected development requirement and bringing into being all forms of legislation to prevent economic reliance and profiteering from building developments and multiple property ownership which skews the market. It seems incredible that dredging and maintenance didn’t remain the responsibility of the Water Companies after Privatisation, but now makes a great deal more sense as we begin to gain a better understanding of the true costs involved and the resistance of any private company to undertake work which may be in the public interest, but which itself is distinctly non-profitable in nature. The Water Companies gain significant benefit from the use of rivers and watercourses both as a source of water and as a route of discharge for treated effluent which no longer has value in its current form. These Companies could once again be harnessed with the responsibility for all the services that they once were before Privatisation and thereby take a more commercial approach to long term flooding defence and maintenance provision, which it would seem most natural for them to do so. With successive Governments already responsible for failing to adequately regulate the profiteering nature of these Companies, the risk that the transfer of this responsibility would be seen as just another opportunity to raise fees would be real. As such, this would be another vital area where Government would have policy making work to do, but where the blood and guts approach of a return to real conviction and end-user focus politics could really make a profound difference in future flooding risk, whilst also dealing with key components of the real cost of living crisis. Ultimately, only significant capital spending of a level which the Country currently cannot afford would provide the sea defences, river defences and perhaps even dykes of the kind seen in the Netherlands that the UK may now actually need to protect against and limit existing threats that exist right now. And there is of course the requirement to ‘future-proof’ or to then prevent against the impact and escalation which comes from the changes in weather patterns. The money to do this will never be available whilst Government spending continues on the levels based only upon election-focussed service provision and a benefits system which propagates legitimate abuse. The services which attract most public money are themselves at risk from the same black financial cloud hovering above us, but could be run far more cost effectively – and arguably at lower cost – with the kind of holistic, joined-up and end-user focus reform that so many services provided by Government now need. Public servants must be encouraged to move away from the ‘what’s will be the benefit or risk to me’ culture and start focussing on a ‘how we can do the best possible for Taxpayers’ culture instead. Sticking plaster solutions are no answer either to Flooding issues or to the many other problems which the Government faces. Parliamentarians seem so unwilling to tackle complex policy making and reform for the greater good and meanwhile, almost everyone else suffers. Getting to the place where communities need to be; a place where they feel safe, protected and able to maintain a basic standard of living that doesn’t require lending money or a compromise of the services that they should be able to expect is a long and tough journey. People must again be trusted locally by Parliamentarians and empowered to deal with the matters which relate only to their own fate, without centralised Policy or non-elected bureaucrats being able to override them. A Coalition Government will never be equipped to even begin taking the steps which will be necessary to achieve this because they are by their very nature a relationship built upon compromise. You will never get the very best solution for all when a compromise has been necessary. We can only hope that the next Government will take their responsibilities to all of us far more seriously. But with things looking as they are, it may not happen next time either. On a day that the reality of modern day, back-garden ‘beds-in-sheds’ or rather the slums springing up across the UK to house immigrants hit the pages, we also see the news that more than half of Councils plan to build on our green belt. You may be forgiven for thinking that there is an obvious link. But the only real relationship between these two issues, neither of which should arguably have ever have become fact, is that they provide a very telling story not only about the excessive cost of housing, but also the very painful reality that members of our communities from one end to the other are being overlooked by Government Policy. In a recent blog, I discussed the issues that sit rather uncomfortably behind the incessant drive on the part of Politicians to build more and more houses as a method of stimulating the economy and solving the UK’s housing crisis, whilst actually doing anything but. As they do so, they are overlooking the permanent damage that will be inflicted upon Towns and Villages up and down the Country, whilst failing to demonstrate either an understanding of the factors which are causing the problems for so many people, or indeed how many more issues that this form of recklessness sold to us as responsibility will cause. My own concerns about the foolishness which is leading the development of these Policies throughout the Local Authority Network and specifically at local level – where many Councillors behaviour can most politely be described as being very similar to that of Lemmings going off a cliff, is well known. My inbox regularly has mail which has been written by local people from right across the area that Tewkesbury Borough Council covers who are rightly and quite simply horrified by the Plans which are now well on the way to being put in place. In many cases these very Plans are being very effectively picked apart by these impassioned members of the public who have very little experience of how the Planning System actually works. Will it make any difference? Probably not. I recognise the value in the arguments they make. Somehow things really don’t add up when questions about the impact on such essential matters as future infrastructure, the merging of historically separate Towns and both fluvial AND pluvial flooding issues seem to go unanswered. I also appreciate that I may be doing a disservice to the multitude of other very localised issues which face other communities across the Country which are just as important to the people that live there, but which I have overlooked just because I don’t have first-hand knowledge of them and most respectfully have no reason to do so. The problem is that the Policy frameworks and guidance on which all local ‘Strategies’ are being set have been stewarded into being by Westminster-based Politicians who should not only know and understand these things, they seem oblivious to the fact that their own knowledge and outlook is actually so limited and are just as immune to hearing or seeing the very clear messages that are out there to tell them all about it. With Politicians drunk and dependent upon the power and retention of their own positions, and whilst they bound around oblivious to the issues that are facing everyone else, there are sadly no forms of breathalyser out there which will demonstrate just how out of control the drivers of this vehicle may be for the unknown period it will take before it crashes and causes us all some significant damage. The one thing that is certain is that concreting over the green belt to build houses that nobody can actually be sure we will need won’t solve the housing crisis on its own. In fact, without dealing with the real issues that sit behind the housing problem and tackling them head on, many more people will find themselves unable to afford to live in them anyway and may have to face the unenviable horror of joining those who are living in what should by now have been consigned to long-term history in the form of anachronistic slums. Christmas will not be that merry for many who have been hit by flooding over recent days, weeks and what has now become months. Even today, news that the seemingly freak weather patterns that have haunted the UK in 2012 are staying put will be sending a shiver down the spines of all those who have closely witnessed or experienced the nightmare of being in a flood. But is the perceived change in weather patterns the only factor we should be considering for future flood protection, or are the issues governing the severity of future flooding events far more deep seated, but with the potential for control? In July 2007 and less than 3 months into my first Term as a Councillor, Tewkesbury Borough sat at what felt to many of us like the epicentre of a disastrous flood which demonstrated just how the impact of unforeseen water damage and a systematic failure to plan ahead can actually be and how its power can touch the lives of people who would never normally have reason to live in such fear. Over a period of 36 hours, home after home in areas that had never been previously considered at risk of flooding became submersed by the affects of just 1 days deluge right across Gloucestershire. Whole Villages went under and for some home owners, many months of pain and torment lay ahead as driveway-based caravans suddenly became the only way to live, rather than the home from home that many choose to put on the road every Easter. Perhaps the most significant consequence of this unpredictable event was the pollution of fresh drinking water supplies at the Mythe Water Treatment Works near Tewkesbury. Residents and businesses throughout Cheltenham, Gloucester and Tewkesbury were left without drinking water for over two weeks and stories of water thefts and fights at distribution points soon made many aware of just how quickly the civilised facade of our society can begin to break down when the basic elements of daily life that we take for granted are put at risk. 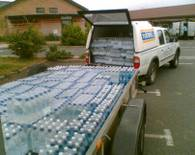 Daily deliveries of bottled water throughout the Ashchurch with Walton Cardiff Ward thereafter and dealing with many flood related issues on behalf of Residents to date has provided an invaluable insight into both the flooding events themselves and the way that the whole issue is handled by organisations as diverse as single-issue pressure groups, local Authorities, the Environment Agency and Central Government. One of the most concerning elements of that experience has been the illumination of the way in which our centrally-derived Planning Laws and Policies simply do not allow people with local knowledge to exert meaningful levels of influence on building which many quietly agree does not consider either extreme levels of river or fluvial flooding or indeed the more concerning and unpredictable rain-based or pluvial flooding. It is such pluvial events as in 2007 that can present those extreme volumes of water in such short periods of time that rivers and streams cease to exist leaving an out of control torrent to create its own destructive pathway to its gravity-borne destination. Most worryingly still is the apparent lack of interest from authorities in these pluvial flood issues, with most prevention work concentrating on fluvial targets and where anything else may be ceremoniously rebuffed with the excuse that such events are so very, very rare and perhaps a only a ‘1 in a 100 year event’. When coupled with such arguable intransigence as the suggestion that built-up land on flood plain by its very nature ceases to be a flood plain – irrespective of where future floods might therefore go; you might see that even politicians like myself have good reason to be concerned for what the future may hold not only for those communities already experienced with floods, but also for those whose experiences may regrettably be still yet to come. It is a frightening reality that Local Authorities with Planning functions are at this very moment in time formulating policies and projections on building development for the next 20 or 30 years. Development which when even only in existence upon paper is by that very existence arguably irreversible when Councils have effectively been coerced by Central Government to let the development genie out of the bottle, thereby granting the wishes of developers who now appear to be out of control. Developers who have pockets deep enough to challenge any refusal to grant planning permission by those Councils who may go against what may actually be official advice and challenge on the basis of what is right. Councils that may if not already, soon be on the verge of bankruptcy because of other centrally derived and disastrous ‘one size fits all’ policies that are serving nobody but their political architects. In times when sustainability is a Government mantra, the unsustainable practice of what is in effect unbridled green-field development has to cease. Housing need must not only be determined by local people at local level; that level of development must itself be based upon what any one local area can support and not upon what Westminster Officials decide as being a requirement. As a Nation, we simply cannot concrete and tarmac over fields in order to sustain exploding population growth which itself is not contributing either the equivalent or more of what it then demands from a paymaster which continues to function well beyond its means. Long term housing projections should cease, not only for being the gift that they have become for unscrupulous land-banking developers, but also because we simply do not know what lies in store for us as a population next year, let alone that which may be the case in 30 more. It is local people and their representatives who should have both the power to decide upon what is and is not sustainable in building terms, along with the right to say no to developers without any fear of unseen bureaucrats undermining or reversing those very same decisions based upon an external and self-serving strategy. Mankind may not have yet discovered the way to change the weather, but a democratic system should actually allow for changes in Legislation which will limit the amount of damage which future flooding events have the power to cause. Local people should have the choice to protect their homes, businesses and even lives right now. Not when there is nothing left insurable.